This post is very long overdue but I’ve been a busy little bee. I’ve dedicated alot of time recently to creating a fitter, healthier me and unfortunately between my family and business it’s left little time for much else. The most exciting news is that next month not only will Madame Macaron be 1 year old, but we will be launching our Macaron of the Month Tasting Club. I’m very very excited about this and I’ve been spending alot of time sourcing packaging because the last thing I would want is a box of smashed macarons landing on someone’s doorstep. I’ve been thinking about doing this for a very long time and all the contemplation is finally yielding something great. I will post more about it next month when all the details are finalized. The other big news is my creation, The Smackaron! To be fair is was an accidental creation, but as many have told me, the best things are done by accident. So what is a smackaron? Only the best thing you will ever taste! I could liken it to a sweetie pie but it’s so much better. So lets say sweetie pie meets macaron. It’s a soft, delicious mound of red velvet macaron mixture (with a tweak here and there), filled with cream cheese frosting and covered in dark chocolate. Need i say more? 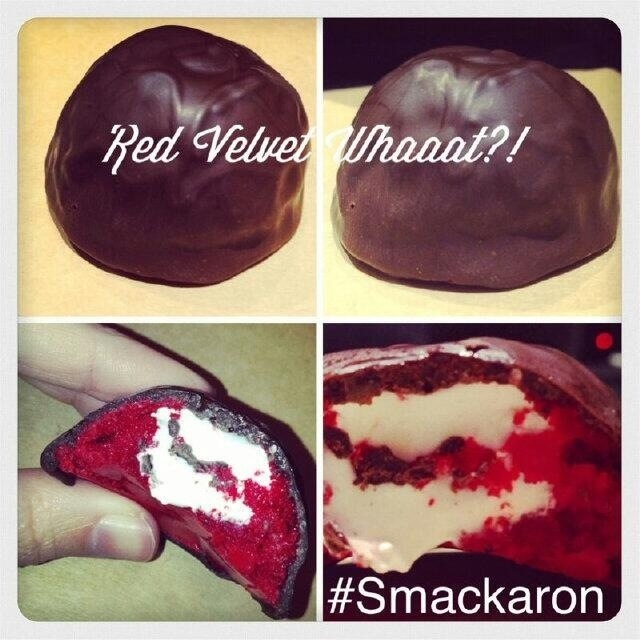 If you love macarons you will adore the smackaron.